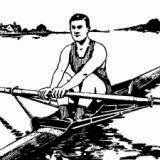 The show-business newspaper Variety reports that the Weinstein Company (who recently produced the intelligent and award winning film, The King's Speech) have purchased the film rights to an upcoming book by Daniel James Brown, The Boys in the Boat, about the University of Washington eight that won gold at the 1936 Berlin Olympics. Impressively, Harvey Weinstein has got the acclaimed British actor, Kenneth Branagh to direct the movie. 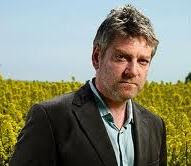 Branagh's previous directorial projects have included many Shakespeare adaptations and the movie blogs seem genuinely excited by the prospect of a film that may transcend the usual sporting movie stereotypes (though, unfortunately, it is been hyped as 'a cross between Seabiscuit and Chariots of Fire'). Branagh is quoted as saying "The Boys in the Boat is an epic. I was completely captivated by the characters, the era, and the dreams of a generation unfolding beautifully and dramatically". Eric Eisenberg of cinemablend.com says: "...what I'm really hoping for from this project is that it is simply a two hour version of the Henley Regatta sequence from The Social Network. If they do that, I see 15 Oscars in their future". The amazing thing about the 1936 'Huskies' and the story of their performance in Berlin is that, if it were not true, it would be dismissed as a ridiculous collection of film clichés which would insult all but the most undemanding viewer. Cliché 1: The young coach, the old master and the former colleague turned rival. In 1927 Al Ulbrickson had taken over as Washington University crew coach at the age of only 24. In the early years he constantly lost to the California crews of Ky Ebright, a former Husky cox and assistant coach. While Cal was to remain UW's greatest rival, the Washington crews slowly got better and better. Ulbrickson was assisted by his friend and former classmate, Tom Bolles (both on the right), and the 'quiet master', George Pocock, the famous boat-builder and coach. Cliché 2: Selection for the Big Race and beating the old enemy - just. By 1935 the training had reached a new intensity and the UW crews adopted the motto 'LGB', meaning 'Let's Go to Berlin' or, perhaps, 'Let's Get Better'. 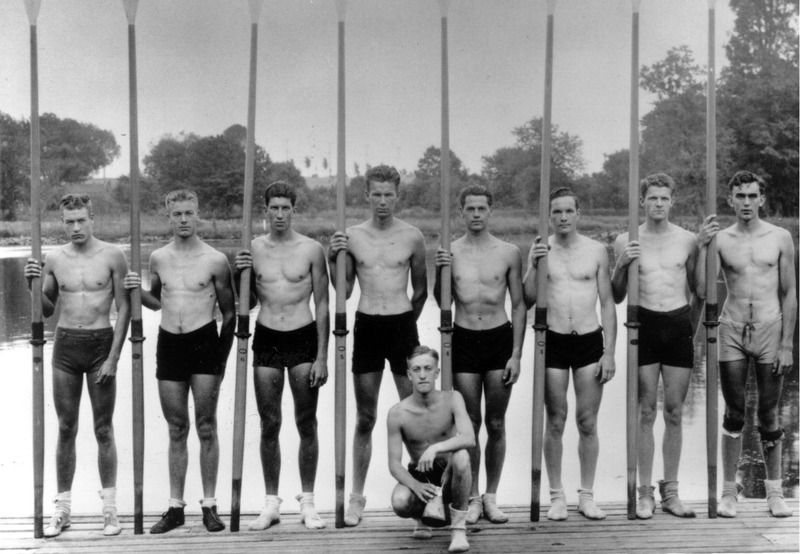 At the Olympic Trails in Princeton in July 1936, the Huskies were competing for the US Olympic place against a good Pennsylvania Club Crew, a New York Club Crew, and Ky Ebright's California Crew. Ulbrickson's strategy was one that had proved successful but was also one that needed calmness and confidence to carry out: start with a low rate and produce a fast finish. Going off at 34 stokes per minute, UW were last and a length down on the leading crew until the rate went up to forty. They took the lead in the final 400 metres and won by a length. '...I think this crew will give a good account of itself in Berlin' said Ulbrickson. Cliché 3: The Big Race is organised by people with another agenda. Berlin 1936 remains the most controversial Games in Olympic history. The Nazis, who had been in power for three years, were not yet universally recognised for what they really were. They exploited the Games as a propaganda exercise to 'sell' the new state to the world and to propagate their ideas about race. The crews that won their heat to get to the eights final were the USA (who beat the much favoured British crew and set a new world record in the process), (Nazi) Germany and (Fascist) Italy. Cliché 4: The Big Race: The star player is ill, 'cheating' by the organisers, winning in the last few strokes. Even before the heat, the '3' man, Gordon Adam and the brilliant stroke, Don Hume, were ill. By the day of the race, Hume was worse but Ulbrickson decided that he would race. There was a strong crosswind and the Germans decided to give the most protected lanes to the slowest qualifiers, which happened to be Germany and Italy. In spite of their protests, the US crew were given the worst lane. Different sources give different accounts of the race; it is clearly one of those stories that get better with telling. Some say that the Americans did not hear the French instruction to start and were dropped on the first stroke. It was certainly true that at 1,100 metres, the Huskies were in last place. The cox, Moch, claims that stroke, Hume, was too ill to respond to his calls for a higher rate. Hume says that he was 'ill but not out of it'. At 1,200 metres Moch was ready to tell the ‘7’ man, Joe Rantz, to stroke the boat when Hume seemed to rally. At 1,500 metres the US boat was third, half a length down from Italy and a few feet behind Germany. In practice their highest stroke was 40 but by 1,800 they were up to 44 and in the next 100 metres they took the lead, beating Italy by eight feet and putting the Germans in third place. The times were: USA 6.25.4, Italy 6.26.0, Germany 6.26.4. Back at the dock, Hitler presented the exhausted crew with a large laurel wreath. 'He wasn't too happy' remembers ‘5’ man, Jim McMillin. The first minute shows the Germans winning the coxless fours final. I think the shot where they cross the finish line has been speeded up as I make the rate to be in the fifties! It is from the official film of the Games by the brilliant and controversial director, Leni Riefenstahl. The close ups and the 'in boat' shots of the eights were not taken during the race but were shot in practice and edited in later as the camera technology of the time would not have allowed anything else. The Americans do not feature in the film very much. They are the crew furthest from the camera at the start. The closeness of the finish can be seen at 3 minutes and 14 seconds in and there is a nice shot of the crew at 3 minutes and 50 seconds in. A great picture and short biography of Al Ulbrickson is here. There is a nice contemporary account of the UW coach in a 1937 edition of Time magazine. 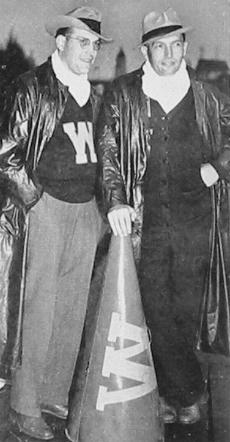 The Husky Crew website has a splendid history section, click here, and even has an audio recording of bowman Roger Morris. The blog, obsessedwithfilm.com cautions that ''...the book is only in proposal form and has not yet been written, no screenwriter will be sought for a while, so don't expect this one to film this year.... perhaps it could be an Oscar 2013 contender''. I look forward to it. I admit prejudice, as a 1967 UW graduate, but I believe the 1936 victory of the UW crew over Germany and witnessed by Hitler is the greatest U.S. team sports victory in history, greater even than the hockey team over the Russians. What Do The Newspapers Write About The Boat Race? Martin Has A Hunch: It's Cambridge! Do We Give A Toss? 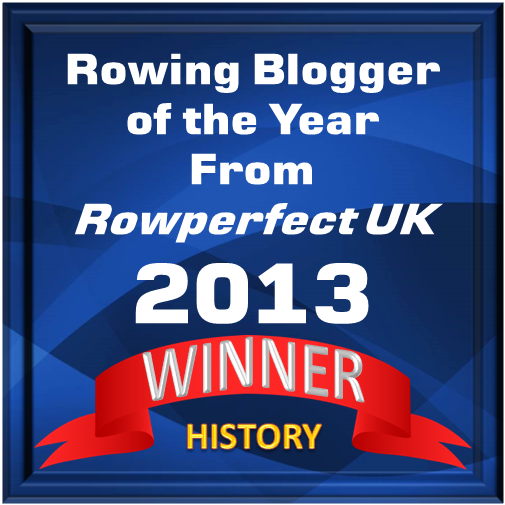 A Rower From Tai Tapu!